A theory concerned with models used to simulate objects and processes such as computers, digital circuits, nervous systems, cellular growth and reproduction. A theory concerned with models (automata) used to simulate objects and processes such as computers, digital circuits, nervous systems, cellular growth, and reproduction. Automata theory helps engineers design and analyze digital circuits which are parts of computers, telephone systems, or control systems. It uses ideas and methods of discrete mathematics to determine the limits of computational power for models of existing and future computers. Among many known applications of finite automata are lexical analyzers and hardware controllers. The concept now known as the automaton was first examined by A. M. Turing in 1936 for the study of limits of human ability to solve mathematical problems in formal ways. His automaton, the Turing machine, is too powerful for simulation of many systems. Therefore, some more appropriate models were introduced. The Turing machine is a suitable model for the computational power of a computer. A Turing machine has two main parts: a finite-state machine with a head, and a tape (see illustration). The tape is infinite in both directions and is divided into squares. The head sees at any moment of time one square of the tape and is able to read the content of the square as well as to write on the square. The finite-state machine is in one of its states. Each square of the tape holds exactly one of the symbols, also called input symbols or machine characters. It is assumed that one of the input symbols is a special one, the blank, denoted by B. At any moment of time, the machine, being in one of its states and looking at one of the input symbols in some square, may act or halt. The action means that, in the next moment of time, the machine erases the old input symbol and writes a new input symbol on the same square (it may be the same symbol as before, or a new symbol; if the old one was not B and the new one is B, the machine is said to erase the old symbol), changes the state to a new one (again, it is possible that the new state will be equal to the old one), and finally moves the head one square to the left, or one square to the right, or stays on the same square as before. For some pairs of states and input symbols the action is not specified in the description of a Turing machine; thus the machine halts. In this case, symbols remaining on the tape form the output, corresponding to the original input, or more precisely, to the input string (or sequence) of input symbols. 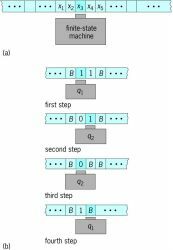 A sequence of actions, followed by a halt, is called a computation. A Turing machine accepts some input string if it halts on it. The set of all accepted strings over all the input symbols is called a language accepted by the Turing machine. Such languages are called recursively enumerable sets. Another automaton is a nondeterministic Turing machine. It differs from an ordinary, deterministic Turing machine in that for a given state and input symbol, the machine has a finite number of choices for the next move. Each choice means a new input symbol, a new state, and a new direction to move its head. A linear bounded automaton is a nondeterministic Turing machine which is restricted to the portion of the tape containing the input. The capability of the linear bounded automaton is smaller than that of a Turing machine. A finite-state automaton, or a finite-state machine, or a finite automaton, is a computational device having a fixed upper bound on the amount of memory it uses (unlike Turing and related machines). One approach to finite automata is through the concept of an acceptor. The finite automaton examines an input string (that is, a sequence of input symbols, located on the tape) in one pass from left to right. It has a finite number of states, among which one is specified as initial. The assumption is that the finite automaton starts scanning of input standing in its initial state. Some of the states are called accepting states. The finite automaton has a transition function (or next-state function) which maps each state and input symbol into the next state. In each step the finite automaton computes the next state and reads the next input symbol. If after reading the entire input string the last state is accepting, the string is accepted; otherwise it is rejected. Questions about synchronization of finite automata have been studied since the early times of automata theory. In the world of contemporary mathematics the use of algebraic structures in computer science control theory and fuzzy automata theory always gain the interest of researchers. Based on the resource space model and cellular automata theory, the integrated framework of metallurgical equipment information space is built. His colleagues in the international computer science community build on his contributions to mathematical models for simultaneously-executed computations re: Petri's net theory, automata theory, distributed systems, integrated systems models, and computation tree logics. Princeton asked me to develop a course in automata theory to expand the scope of the curriculum beyond the digital design course then being offered. This great scientist entered the domestic history of IT as a developer of digital automata theory, supercomputers creator and founder of the Institute of Cybernetics, Chairman of the SASII said. Additive cellular automata theory and its application i, ieee computer society press, california. Among specific topics are a license plate recognition algorithm based on radial basis function neural networks, fabric weave design based on cellular automata theory, the experimental education of technical courses in the information age, learning causal semantic representation from information extraction, a symplectic scheme of the Gross-Pitaevskii equation, and a humanoid intelligent control system of plastic corrugated board synchronous shearing.